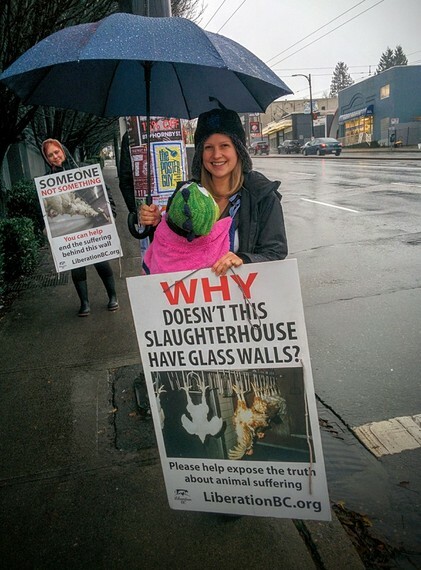 Why Are These People Standing In the Pouring Rain Outside a Slaughterhouse? On a busy urban street, a grey building without a single window hides in plain sight. Each business day, thousands of frightened animals will take their last breath inside this building. It's a chicken slaughterhouse and processing plant. Arriving by the truckload, chickens will be pulled from crates and yanked into shackles on a fast-moving conveyor belt. They will be sped to their deaths, and beyond into crisp packages bound for grocery stores. 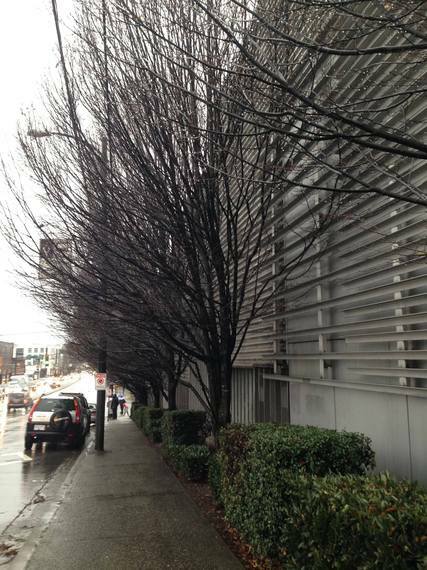 This weekend, in the midst of a rainstorm, a small crowd gathered outside. 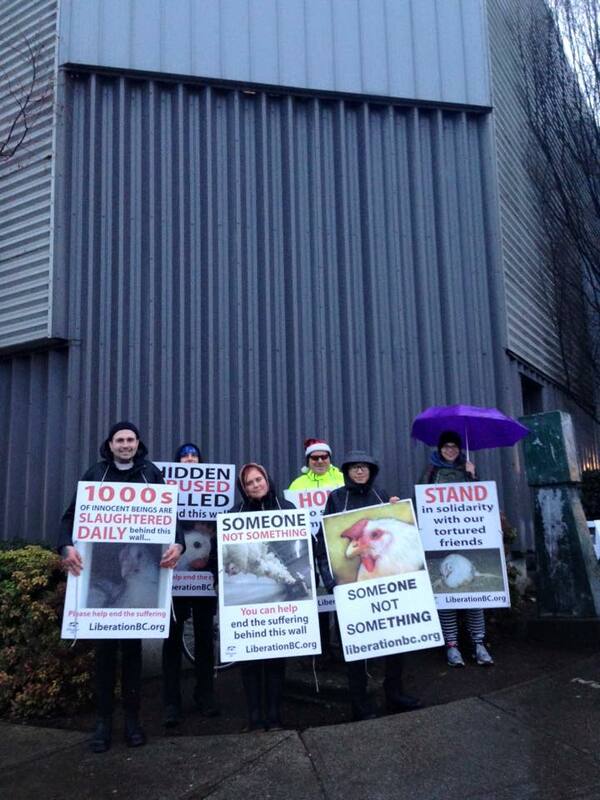 Darren Chang explains that the demonstration--a vigil--was inspired by the international Save Movement, which invites people to gather outside slaughterhouses and bear witness to the doomed animals arriving on truck after truck. 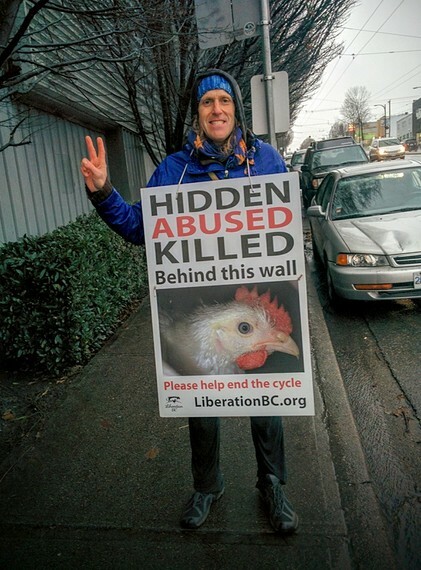 The goal of this vigil, Darren says, is "to expose the violent realities of animal agriculture, present animals as individuals rather than commodities, as well as to reach out to the public to advocate for veganism and animal liberation." As a youth, Darren first became aware of the suffering endured by farmed animals when he saw a video of a cow being led to slaughter. He could never forget, he says, how "the animal in the video struggled wide-eyed every step of the way to the kill floor against the men who dragged her there." Later, while studying political science and philosophy at university, Darren took a course examining the relationship between humans and other animals, and came to understand animal rights as inseparable from other social justice movements. Mick McCann was attending his first demonstration this weekend. He says that although he'd always felt nervous about attending, he's made a conscious effort to get more involved with direct action, saying "I've been a punk for a long time and punks have a history of protesting against oppression so I suppose it's always been in my culture." Mick is originally from the countryside in Galway, Ireland, where he was surrounded by animals, including those typically killed for food. It never sat right with him to have close relationships with animals while also eating them. He says, "I think all humans are like that, though most repress these feelings." Natasha Moonbeam also grew up with farmed animals, living on a beef farm for 18 years. At age four, a cow she cared about was slaughtered, and she never ate meat again. Now, she regularly attends vigils and other demonstrations, and has dedicated her life to advocating for animal rights. She's frustrated, she says, because "society has decided that certain animals are lovable and others are eatable and disposable." 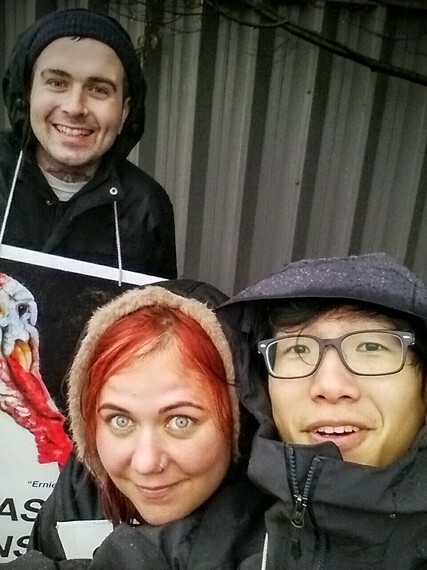 It was cold, wet, and windy on Saturday when Darren, Mick, Natasha and a few others gathered at the vigil. Natasha wasn't complaining. She explains that she's intensely aware that chickens don't have the freedom or choice to feel weather of any kind for most of their lives. She says, "Standing outside in the rain for an hour can't even touch the surface of the pain and torture that these beautiful animals endure. They are born to ultimately have their lives taken from them after prolonged suffering. I am here because I truly believe that it is unfair that my life matters more then theirs." Darren explains that the vigils take place regardless of weather. 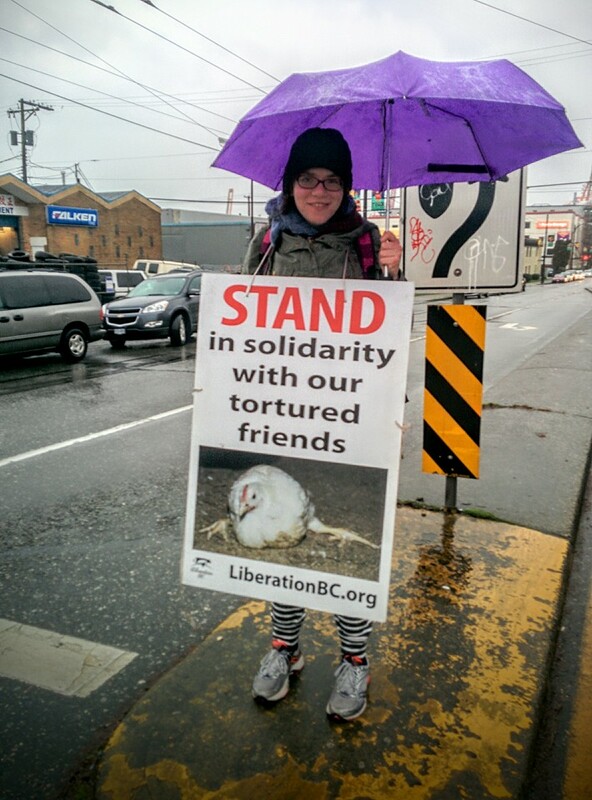 Although quick to acknowledge that being out in bad weather is not for everyone, he points out that the very act of standing in the rain holding signs can draw attention. By witnessing this powerful devotion to a cause, passersby realize that the issue is urgent. And besides, Mick adds, "the thought of all the chickens in their horrible conditions is a hundred times worse than me standing in the rain with lovely people."